Manufacturers Index - Buffalo Pitts Co.
Twin brothers Hiram A. Pitts and John A. Pitts of Winthrop, Me., were granted a series of patents beginning in 1834. In 1837 they patented a new type of thresher, a "continuous apron" style, and they licensed it to several other manufacturers including Jerome I. Case. Hiram moved to Chicago and established an agricultural equipment manufacturer there, and John moved to Albany and then to Rochester, NY, where he partnered with Daniel Carey and Joseph Hall to build Carey's patent horse power. In 1852, Hall was assigned a thresher patent without Pitts, a move that marked the end of the partnership. John Pitts moved to Buffalo in 1851 or '52 and established his own agricultural equipment manufacturing firm, the John A. Pitts Company. On John's death in 1859 the business was taken over by son Calvin Pitts and son-in-law James Brayley. In this era the company went through a series of names, including Buffalo Agricultural Works, Pitts Agricultural Works, Brayley & Pitts' Works, and, eventually, the Buffalo Pitts Company. Beginning in 1880 the Buffalo Pitts Co. made products of interest to this website: steam traction engines and portable steam engines. By 1900 the company was no longer thriving, and in 1914 it entered receivership. A 1915 catalog had only steam engines, the other product lines having been either discontinued or sold off. An exception was the company's thriving line of road-building machinery that was organized as a subsidiary, the Buffalo Steamroller Company. In 1916 that subsidiary merged with Kelly-Springfield Road Roller Company to create the Buffalo-Springfield Roadroller Company of Springfield, Ohio. Meanwhile, the manufacture of steam engines continued under the Buffalo Pitts banner. Unfortunately the 1910s was the end of the steam engine era, and lacking the financial resources to modernize its product line, the Buffalo Pitts company faded away. Brian Szafranski's Buffalo Pitts web site provided much of the history of this company. The list of premiums awarded at the 1857 New York State Fair includes a diploma awarded to Buffalo Agricultural Works for their mortising machine. This was likely to the Buffalo Agricultural Machine Works, a similarly named but separate firm that is known to have made a mortiser. E. R. Jewett's 1858 Buffalo Directory lists Buffalo Agricultural Works, John A. Pitts, proprietor, located at Carolina corner of Third. E. R. Jewett's 1860 Buffalo Directory lists Buffalo Agricultural Works, Brayley & Pitts, proprietor, located at Carolina corner of 4th. Foreman (and machinist) was Calvin W. Pitts. The 1866 book The Manufacturing Interests of the City of Buffalo. Brayley & Pitts' Works occupy a part of two squares of ground, bounded on the Erie Canal, Carolina, Fourth and Efner streets. The late Mr. John A. Pitts came here in the year 1851; he had already established several small works: the first one in his native State, in the town of Winthrop, Maine; in Albany and Rochester N. Y. and in Springfield, Ohio, laboring all through those fourteen years with indefatigable energy and toil to introduce to the farmers this valuable machine. He was the first to establish in this city a manufactory of this kind. This establishment is indebted to him for its celebrity, mainly for the valuable inventions made by him. This gentleman is accredited with having invented the Treading or Endless Chain Horse Power, which was patented by him in 1836; also for the first Chain Pump, and the first combined Thresher and Separator, patented in 1837; the latter is now a leading article manufactured at these works. Important improvements have been made in the construction, operation, and capacity of this machine since it was first invented, at first requiring only the power of two horses, and threshing about one hundred bushels of grain per day; now various sizes are made, for four, for size, for eight and for ten horses; also larger sizes adapted for steam power, which will thresh and clean from 2,000 to 3,000 bushels of grain per day. From five to six hundred of these machines are now made and sold annually from these works. Since first invented, there have been added some valuable improvements, one of which is for measuring, counting and bagging the grain, another for elevating the straw and delivering it on the stacks. The value of such a labor saving machine as this can hardly be computed. In these works are moulding rooms, where they make their own castings; a large lumber yeard, where sufficient lumber is constantly on hand to be sufficiently seasoned before being worked into the machines. The iron or machine shop is large, and supplied with the best tools to be had. The wood shop is also supplied with all the most improved tools for this branch of work. The increasing demand for this machine over all others of similar style is attributed of late years to the excellency of the materials and its good construction; their renown in this respect is world wide; it is said they are the only machine that stand the very dry and scorching climate of the Pacific coast. Large numbers are sold annually for Australia, and for South America, California and Oregon. Since the close of the rebellion, orders are again coming in from Texas and other parts of the Southern country. They employ from one hundred and thirty to one hundred and fifty men, and use of pig and bar iron about one thousand tons annually. The pig iron is from the Salisbury and other charcoal furnaces, of the very best brands. The bar iron is from the rolling mills in this city. Annual report of the Attorney General of the State of New York By New York (State). Attorney General's Office 1903 page 608. On 23 Mar 1903 the Attorney General of the State of New York allowed the Buffalo-Pitts Steam Roller Works to change its name to the Buffalo Steam Roller Co.
Buffalo Pitts Co. catalog 1903, page 2. The Buffalo Pitts Steam Roller Works, Buffalo, N. Y, has been incorporated in 1902, with a capital stock of $125,000. The company intends to manufacture road rollers and engines as well as import and export the same. The directors are Carlton Sprague, Charles M. Greiner and Henry S. Cunningham. A History of Buffalo by the Progress of the Empire State Co. 1911, page 2. Among the manufactories that have had importance in the industrial history of the city and a continuous career, is that which bears now the name of the Buffalo Pitts Company. Its founders were John A. and Hiram Pitts, twin brothers, of Winthrop, Maine, who were the first American inventors of threshing machinery, and who patented, in 1837, the first successful threshing and separating machine combined. Prior to this they had made improvements on the old style of thresher, which turned out grain, chaff and straw together, to be separated by another operation. In combining the thresher and the fanning mill, producing the "endless apron" or "grain belt" separator, they opened a new era in that line of invention, and the principles covered by their original patents have been followed in all improvements since. In 1840 John A. Pitts came to Buffalo and established the manufacture of the new threshing machine here, at the corner of Fourth and Carolina streets, from which place the shops have never been changed, though enlarged till they contain many acres of floor space. On the death of Mr. Pitts, in 1859, the management of the business passed to James Brayley, who conducted it for many years. In 1877 the proprietors were incorporated, under the name of The Pitts Agricultural Works, James Brayley president, Thomas Sully secretary. This title was changed to that of Buffalo Pitts Company in 1897, when Carleton Sprague became president of the company. Recently Mr. Sprague retired, and the present officers of the company are C. M. Greiner, president and treasurer; William G. Gomez, vice-president; John B. Olmsted, secretary. Under all administrations the business has expanded continually, its products going to all parts of the world. Those products are not only the threshing machinery for all kinds of grain, flax, rice, beans, etc., but traction and portable engines, that burn wood, coal, straw or oil for fuel; special steam traction engines for plowing, hauling and grading; road locomotives and road freight cars for hauling ore, timber, logs, etc., and special cars for carrying and spreading crushed stone. The development of the steam traction engine is due to this company. The plant of the company is operated by electric power from Niagara Falls, and is equipped with the latest and most complete system of electric and pneumatic machinery. It employs a large force of men, and the shops are run throughout the year. The company maintains important branches at Minneapolis, Fargo, Portland, Oregon, Spokane, Wichita, Houston, and other points east and west. A History of the city of Buffalo Buffalo Evening News 1908 page 91. The Buffalo Pitts Company is without doubt one of the largest and most successful manufacturers of steam traction engines and threshing machinery in the world. Its business was established here in the city of Buffalo in the year 1837, where from a small, conservative beginning the plant has grown to be one of the largest in existence, and attracts a trade unequaled by any similar industry in the history of our commerce. The main offices of the company are located here, while important branches will be found at Fargo, North Dakota; Minneapolis, Minnesota; Portland, Oregon; Spokane, Washington; Houston, Texas; Wichita, Kansas; Madison, Wisconsin; Toledo, Ohio; Omaha, Nebraska; San Francisco, California; Peoria, Illinois; and Saint Louis, Missouri. The main plant of the company is located at Fourth and Carolina streets. Here, over fifty years ago, was invented the first threshing machine with proper devices for threshing and cleaning the grain in one operation. Prior to these inventions by the Pitts brothers there existed only such machines as would thresh the grain from the head, the straw, chaff, and grain falling in a mass behind the machine, to be separated by hand. The development of the steam traction engine for motive power for threshing, hauling, grading, and plowing is due to the never-failing energy of this company. Buffalo Pitts engines will be found in every country where grain grows or highways run. From the small farm lands of the East to the Pacific Coast, in South America, Australia, the Philippine Islands, Russia, Austria, and Germany the products of the Buffalo Pitts Company are known for their excellent construction and durability. The plant of the company is not only the largest, but is the only one of its kind operated by electric power from the great falls of Niagara. It is equipped with the latest and most complete system of electric and pneumatic machinery. A large force of first-class mechanics is regularly employed, and the shops are run throughout the entire year. 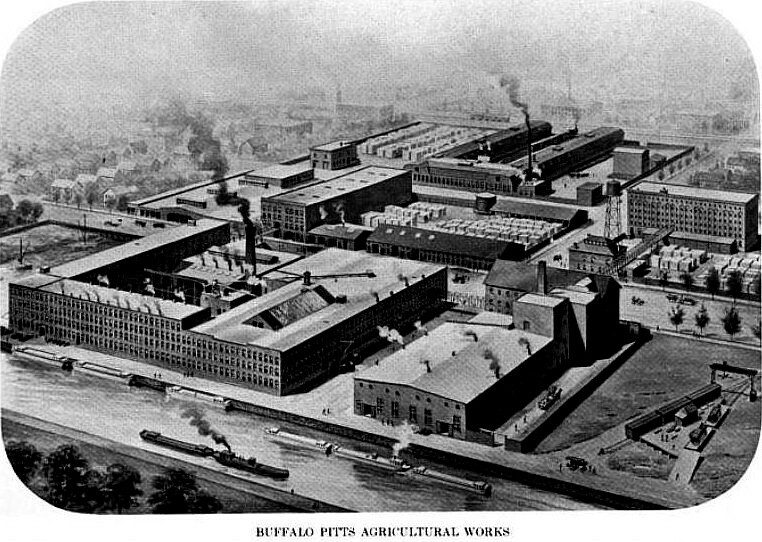 The products of the Buffalo Pitts Company consist of large machinery, and include traction and portable engines that burn wood, coal, straw, or oil for fuel; machinery for threshing, separating, and cleaning all kinds of grain, flax, rice, beans, and so forth; special steam traction engines for plowing, hauling, and grading; road locomotives and road freight cars for hauling ore, timber, logs, or coke; and special cars for carrying and spreading crushed stone. These products are shipped to all parts of the globe. The officers of the company are C. M. Greiner, president and treasurer; William G. Gomez, vice-president; John M. Olmsted, secretary. Steam Power on the American Farm by Reynold M. Wik, 1953 pages 252 & 254. John Avery Pitts and Hiram Abial Pitts were born in Clinton, Maine, December 8, 1799. They received common school education and learned the blacksmith’s trade in their father’s shop. They lived in Winthrop, Maine, for some years, carrying on their trade there. The brothers early developed mechanical and inventive abilities. In 1830, they patented a threshing machine with an improved railway tread power, which consisted in the substitution, under the movable platform, of an endless chain of rollers, for the leather belt. They began the manufacture of this device, introducing it into New England States in connection with the common thresher or “Ground Hog”, as it was sometimes called. Later they conceived the idea of combining this improvement applied to the old-fashioned thresher, with the common fanning mill, in a portable form; and after years of labor, produced in 1834, the first practicable separating thresher put in actual use. Other improvements were gradually added by the two brothers, and on December 29, 1837, a joint patent was granted to them for the new machine, which was the original of the great family of “endless apron” separators. This machine was capable of threshing from 300 to 500 bushels a day. Its direct descendant, the Buffalo Pitts Steel Frame Thresher for 1910, threshes from 2,000 to 4,000 bushels of grain a day. John A. Pitts and his brother Calvin, left Maine and engaged in the manufacturing of threshing machines, under the name of the Pitts Agricultural Works in 1837, first in Albany, N.Y. and Rochester, N.Y., then in Springfield, Ohio, and finally in Buffalo, N. Y., in 1851. They incorporated as a stock company in 1877, which is now the Buffalo Pitts Company, the name having been changed in 1897. This is the oldest threshing machinery company in the country. Mr. Pitts subsequently invented an attachment for measuring and registering the number of bushels threshed and bagged, and received a gold medal at the Paris Exposition in 1855. Hiram A. Pitts retired from the Pitts Agricultural Works in 1855, and moved to Chicago, Illinois, where he engaged in business for himself. John A. Pitts died in Buffalo, N. Y., July 1, 1859. The growth of the business originated by Messrs. Pitts has been wonderful. In 1851, the plant consisted of two small brick buildings, one three stories and the other one story high, and a one-story frame building, 16 x 20 feet, which was used for an office. The office force consisted of three clerks, and the head clerk received a salary of $600.00 dollars a year. The property, when purchased by John A. Pitts, was a deep swamp or gully on the banks of the Erie Canal near the shore of Lake Erie. It was entirely unfit for building purposes until filled in with Lake Erie sand, which was conveyed from the beach in wheelbarrows. For this purpose four canal boats were anchored twenty feet apart, and planks extending from one to the other, which formed a portable bridge; and over this structure twenty men labored several weeks wheeling sand, and working fourteen hours a day. The number of men on the factory pay roll was in the neighborhood of one hundred and twenty. Today the factory of the Buffalo Pitts Company cover fifteen acres of floor space, and on its pay roll is an army of from seven to eleven hundred men. The development of the machinery has been as great as that of the factory itself, from the first small thresher, scarcely larger than a grand piano, and the horse-power which operated it, to the powerful engines which plow the vast grain fields of the west, and operate the steel frame threshers of almost limitless capacity, which prepare their harvests for threshing.